Imagine inviting people for lunch who then snoop round your home, critique each course and vote on it at the end. Imagine that the guests are all food bloggers. Sounds like your worst nightmare? Why did I volunteer to submit myself to this excoriating challenge? The chance to eat four fantastic lunches prepared by some of the most talented and enthusiastic cooks, of course. For that I’m prepared to put up with a little torture myself. Don’t get me wrong, I love cooking for a bunch of friends – but this audience is seriously discerning. Who is this exalted company (I’ll use initials so you know who I’m talking about)? J looked bemused as we whipped out our cameras (he hasn’t hung out with a gaggle of food bloggers before). My teens had sent me off with strict instructions to rifle through H‘s shoe cupboard in the manner of the TV version of Come Dine With Me. I was immediately seduced by her light airy villa, gorgeous table setting and warm welcome so felt I couldn’t possibly betray any secrets of my hostess…could I?! H‘s salmon carpaccio had been replaced by tuna as she hadn’t found salmon fresh enough and was appalled to learn that the Tasmanian wild salmon sold in Carrefour was fresh (i.e. had been on a 14 hour plane journey) not frozen. As fish starts to deteriorate the minute it leaves the water you need to consume within hours or freeze immediately. Doesn’t this look divine? 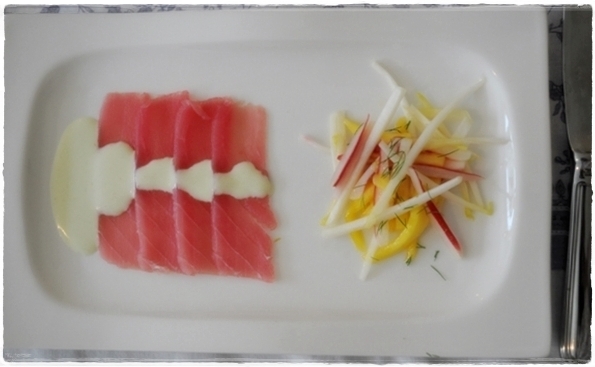 A lemongrass dressing and a salad of endive, radish and green mango was the perfect foil for this silky rectangle of tuna. We all made little cooing noises as the next plate appeared but a few, including me, were a bit tentative about how to tackle the beautiful Omani lobster. When curiosity about food unites nothing is taboo so we felt at ease asking for advice (which you wouldn’t if at dinner or a restaurant). We probed the inside of the shell with our knives as instructed and revealed fronds of tarragon lining the curve of the shell imparting a subtle but relevant flavour to the sweet white lobster flesh. It came with lemon risotto and mustard greens. Sticky date pudding ended the lunch and a ‘proper’ cafe latte. I’ll just let the pictures do the talking here (and the scraped clean plates). 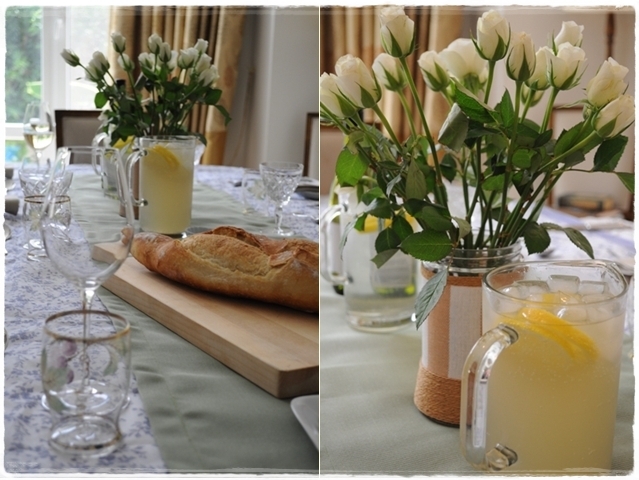 We drank iced lemon and ginger fizz, sparkling date drink and Wither Hills Sauvignon Blanc. S asked and we tried to explain the taste and appeal of alcohol – I don’t think she was convinced! Overall verdict? The bar has been set super-high. I would eat the whole menu again – today. H was disappointed by her risotto (al dente but not creamy) which perhaps was the only flaw, but grilling lobster to perfection and producing risotto at the same time was a real challenge. No, no, no – I couldn’t possibly reveal any secrets. What? Oh alright then. Just don’t tell H.
wow lady, respect for you all! Sarah’s done a pro job, I’m stunned. No words…! Ha ha Arva – I don’t care if I come last …the judging is such a pleasure! Congratulations #comedinewithmedxb! I love how the date plum was presented, very pretty! Excited to read about the next one. Nice one Sally! Photos look great, must bring a camera myself next time! sally!!! you guys are the best and the bravest!!! Now you all can see what we’re up against. Beautiful summary Sally. I’m just a tad nervous now!!! What fabulous fun! And thanks for allowing us to be part of it through your post and pics. 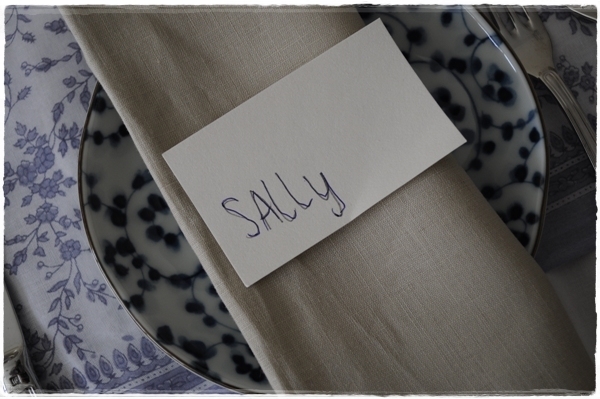 Lovely Post, Sally! Indeed, Sarah has set the bar very high. I had a wonderful time. Now that we have started this, I don’t dream about Come Dine With Me anymore. Quite a relief. Can’t wait for the next round at S.
Oh my, what a fabulously fun idea. Not sure if I would be brave enough to partake. I am looking forward to pat 2. The food looked fabulous! I must try the Omani lobster grilled one of these day. Lovely piece to read Sally. Everything looks so delicious with an artistic touch. I can see how this can get a little scary! Wonderful summary, thanks for sharing with us. Can’t wait to see what everyone else has to offer. WISH I took part in this!!! 😦 if only coursework wasn’t an interference ! Really interested in how you ran the competition Tandy. Loads of interest here so might follow your lead for a future event in Dubai. Oh my Sally!! What an amazing meal! A fabulous read and the pictures are just gorgeous! Loved reading this post. Good job! Wow! I had never heard of Come Dine with Me, and just watched a couple of snippets on BBC. How fun, although a tiny bit odd. Do the guest actually wander around the house and critique it? Hmm. Food looks wonderful and sounds like you had a blast! As total food fanatics (and wanting to preserve our friendship!) we dedicate ourselves more to the eating part of the concept than the snooping! On TV they are fairly merciless though (yes a bit odd! ).